A well-groomed horse is about far more than just elbow grease; it reveals a lot about the overall professionalism of the barn. Denielle Gallagher-LeGriffon began her career as a groom at 20 when she moved from her home in Hampton, NB, to work for Juergen von Buttlar, who trained horses on the flat for Eric Lamaze in Schomberg, ON. For two years, Denielle worked as a groom and travelled to California and Spruce Meadows, AB. She then groomed for Ashley Holzer and benefitted from her coaching while she warmed up the four-time Olympian’s horses. This job also gave Denielle the opportunity to travel to international competitions including the 2004 Olympics in Athens, Greece, and the 2006 World Equestrian Games in Aachen, Germany. Denielle now manages Brilliance Stables, the import sales and training company she owns with her husband, Bertrand LeGriffon, with four grooms of her own to help manage the workload. During the winter, she trains and competes at the FEI level from their new facility in Wellington, FL. During the summer months, the team works out of a busy stable in Suffern, NY, managing the facility for Ashley and Rusty Holzer. Denielle trains with Holzer on Argo Conti Tyme, an FEI-level horse which she co-owns with Evi Strasser. What are the essentials in your grooming kit? The metal curry comb is a must. It has two uses: not only is it good for improving the circulation in the skin, it’s also useful for scraping the shavings off of the blankets! In addition to that you need a hoof pick with a brush on it, a rubber grooming glove, and a mane comb. A really good polishing brush is also important. Other than that you need a lot of elbow grease and a consistent approach to grooming. Walk us through your usual grooming routine. Taking the time to curry each day will make it easier for you to have a shiny horse at the show grounds. The more you curry, the softer the hair particles become, which makes them smooth. This also removes any dead skin cells and helps bring the oils of the coat to the surface and gives it a shiny appearance. 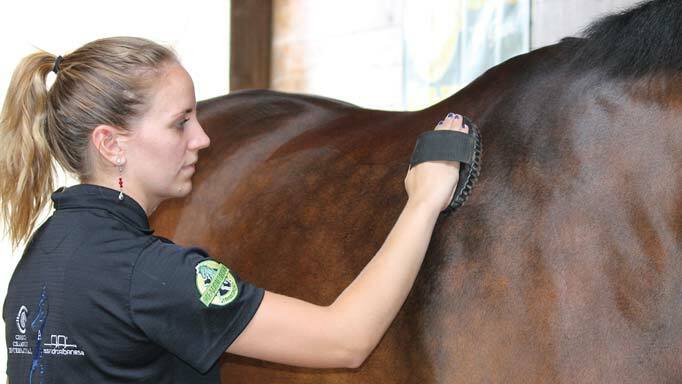 Keeping your horse clipped and always neat-looking will have you prepared for any last-minute shows as well. I regularly groom with a metal curry, because you get all the dead skin cells out of the coat and you also lift out the dirt and sand from turnout. Some horses don’t like the metal curry at first, so you have to be nice about it and not scrape them with it. If you use it gently, they learn to enjoy it. The technique is this: you use the metal curry to rough up the coat and then you follow with the soft dandy brush, scraping the brush on the metal curry periodically, and then banging the dirt you have trapped there on the top of your dandy brush. 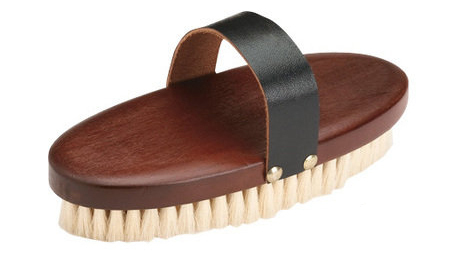 You brush and scrape the whole body; that’s a great way to get them extra-shiny. At night, after I give them a bath and they’re dry, to make them really, really shiny I go in with a rubber grooming glove and a really soft body brush and I do an overall body curry, brushing against the direction of the growth and then smoothing it down so that it breaks the hair follicles and brings the oil up into the coat. I do the head, the face and the ears as well – a really well-groomed horse has a shiny head! Our climate makes it difficult to bathe our horses as often as we would like. How do you keep horses clean between baths? It’s a challenge – one way is to keep them clipped so you can always take a damp towel to clean them, and if you spray some coat conditioner onto the towel it helps to lift the dirt off. Another way to keep the horses clean is to keep the stalls as clean as possible – the horses are going to stay much cleaner, and so are your blankets. All professional grooms pick the stalls at least twice a day; they are done in the morning and then they do a quick pick in the afternoon. I even do it again at night check, too. I do it three times a day at shows as well. The other advantage of keeping the horses clipped is that it helps prevent scratches. [Also called mud fever, scratches is a chronic, flaky-skin dermatitis causing abrasions and oozing on the back of the pastern and fetlock.] Especially in Florida, keeping the hair clipped really short and washing and drying the legs really well every day really helps. We wash the legs every day with a gentle-on-the-hands antibacterial dish soap that is mild and safe. We also wash their faces every day with baby shampoo and towel dry really well. The tip is to keep the horses really clean and as dry as possible. Everyone wants to have a nice-looking tail. Any tips for that? Tails are high maintenance! Tail hairs break when they are brushed when they are dirty and tangled, so the cleaner they are, the fewer hairs will break off. We wash the tails a couple of times a week and always use conditioner. We use Pantene Sheer Volume for the tails, which makes them really big. We wash them once or even twice (just like you do with people hair), and then I apply the conditioner so it’s really thick. Then I tie the tail in a knot while I wash the rest of the body. Take out the knot and rinse the tail out really well. We use Cowboy Magic Detangler and Shine when it’s still wet, and that really helps to prevent pulling the hairs out. When the tail is dry, you have to twist the hair to the bottom, and then comb from the bottom up to get it really tidy and detangled. We also use Neutrogena Residue Removal every couple of weeks, and the Pantene and the Cowboy Magic in between. I also like to use Show Sheen every day to make sure the dirt and the tangles stay out of the tail. How do you get white markings to look bright? With a white horse or white socks we use blue shampoo and we’ll use black hoof oil on black hooves to make a brighter contrast. But under FEI rules you are not allowed to alter the colour of the hooves – you can’t put black colouring on a white foot, so on light-coloured hooves we use Absorbine Supershine, a clear polish that dries shiny and clear. We also keep the hair clipped very short on the legs ,which helps keep them dry and bright and also helps horses that are prone to scratches. What about tips for braiding? We always wash the manes before we braid them; scrubbing the manes really well will ensure that there is no dirty grey color between the braids. In our regular grooming sessions we brush the manes to one side to keep them lying flat, and that really helps if you do this every day. We also use a dandy brush that’s been dipped in water and shaken out to brush the mane before the horse is ridden. This helps to train it to stay in place. A good way to train a difficult mane and make it lay flat is to pull it first, braid it over in small, neat braids, and leave it for three days. Then remove the braids, wash the mane and comb it flat to dry. Continue these steps repeatedly until the mane “trains.” Usually it helps if the mane is a little bit longer. I usually keep my manes one flat hand’s-width from the flat side of the neck. This also helps you to do bigger, better rosettes if you are doing dressage braids. Make sure the manes aren’t pulled too short, because that makes them harder to manage, which is really stressful right before a show! It’s a good idea to practice until you know how short to make the manes and that way you’re not in a panic. We use Quic Braid to make the hairs easier to grip, but you can always use water for this as well, and we spray each section before we braid; this helps make the braids look tight and neat before we top them off with a high-shine spray. This way you will have shiny, perfect braids. What’s your number one grooming advice? To have a clean horse, you have to have clean brushes, because otherwise you’re just putting dirt back on the horse. The best way to wash your brushes is to put them in the washing machine on a delicate cycle with a little bit of soap. [You can secure them in a mesh bag if you want.] This gets them really clean; then you just let them air dry. You should do this at least once a week to keep them really clean. Clean blankets are also key; it’s a good idea to wash the sheets every week, otherwise you’re putting a dirty blanket on a clean body. What works well is to brush the blankets off with a metal curry and wash them using a cold-water formula in cool water so they don’t shrink. Why is it so important to have a well-groomed horse? I think how well the horse is turned out says a lot about the professionalism of the barn and the rider. If the horse looks dull, there are shavings in the tail, and the tack is not clean and oiled, I think that indicates that the horse is not getting top care and that the rider and the trainer are not professional in their approach. It sounds minor, but shoddy grooming makes me worry that the people managing the horse are not paying attention to the details, and that’s a cause for worry, because they could be missing other things like swelling in the legs, and how the horse is eating, drinking, and feeling in general. I think how horses are handled on the ground makes a huge difference in how stressed they are and how well they perform, so paying attention to the details can make the difference between winning and losing at the show. Grooming 101 for thw most messy time of year. 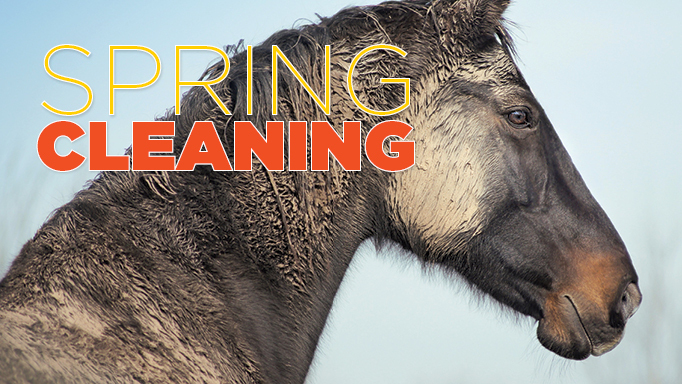 Q: How can I keep my horse's brushes clean and in good condition?